This is the final part of my discussion of my favorite physical board game components. These are the top three items that help to make physical board games a viable experience in the digital age. 3) Poker Chips – Every time I walk by a set of clay poker chips in an aluminum case I have a powerful urge to buy it. Even though my focus here is on the physical attributes of these components, poker chips also carry with them so many psychological associations. A big pile of poker chips is symbolic of great wealth and good fortune, even if you can’t go cash them in for millions of dollars. They remind us of the American west or the glitz of Las Vegas. Poker chips seem like a piece of Americana, and, since European gambling chips are quite different, in a way they are. Even cheap, plastic chips are fun to flip, fiddle with, and stack into imposing towers, but the official clay chips are the ones that really enhance a gaming experience. They feel earthy and old even though the bright colors announce they are quite modern. The weight of a real poker chip adds to the pleasure of manipulating it in your hands as you nervously await the next card flip. 2) Playing Cards – Card games are basically their own category of game since there are so many different ones. A basic 54-card deck is in itself a marvelous thing. Collectors acquire hundreds of different decks because of the beauty and history of the various designs. Expert card players perform fancy shuffles. Magicians deftly maneuver the exact card they want. Nervous gamers constantly rearrange the cards in their hands. Although the basic information on most playing cards can easily be represented with a few symbols on a computer screen, something truly is lost when you can no longer feel those cards in your hands. What’s most interesting to me about cards is that each one represents a discrete unit as if they almost take on a life or personality of their own. We talk about cards being buried or having to fish for a card from the deck or a card refusing to come out. Although a good digital set of cards will use a realistic algorithm for randomizing card draws, we somehow don’t think of the cards in quite the same way if they aren’t physically in front of us. Even cheating is associated with the physical nature of the cards as they can become marked – intentionally or through use – to give away their identity. Although this would seem to be a disadvantage of the physical medium, it still adds personality and a different dimension to playing with the real thing. 1) Dice – Rolling a die and moving a piece is one of the simplest and oldest board game mechanisms. Modern, strategic games have added layers of complexity onto this idea so that when to roll and what you need to roll and how many dice you roll might depend on the situation, but, ultimately, the thrill comes down to shaking those polyhedrons in your sweaty hands and letting them loose on the table, watching them clatter and dance with your breath held in anticipation. The sound of dice bouncing up and down on the table or banging against one another is all too familiar to gamers. Many gamers can’t have a die anywhere near them without feeling an urge to roll it, even if no game is being played. The importance of these physical aspects can be best seen in various digital games that simulate dice rolls. Often these games will have the player swipe their finger across the screen to simulate tossing the die and then an animated die will tumble from corner to corner while sound effects make that familiar clacking sound. Why go to so much trouble when we could easily just push a button that says “roll die” and have a number magically appear? It’s because rolling dice is pleasurable, and, somehow, when we see that physical die settle on a particular face we are more willing to accept our fate than if a random number generator spits out a result. 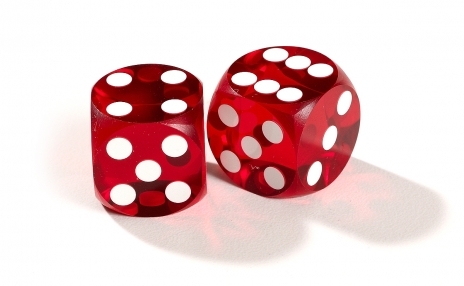 This is even more true with precision dice that have been scientifically shaped and weighted to ensure randomness. So that’s my list of favorite components. As much as I enjoy the convenience of having a computer program move my pieces or remind me of the rules while playing, a touch screen can never fully replace the feeling of rolling dice, slamming the winning card on the table, or pushing all your chips into the middle.